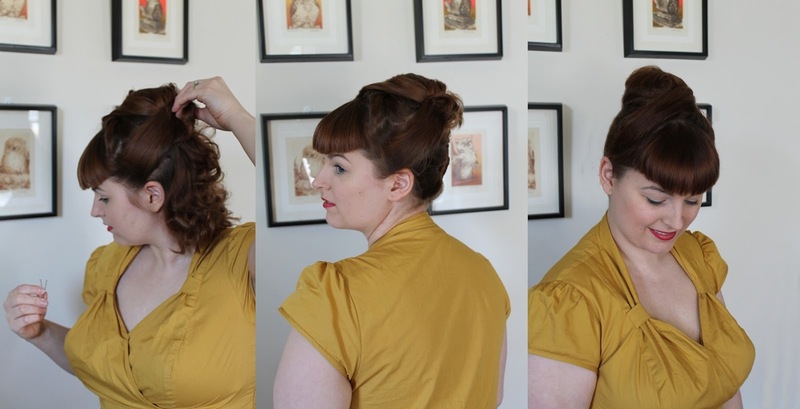 In this month's issue of Hey Doll I wrote a tutorial for my no-tease beehive, which has been my new favorite go-to style. It's very quick and easy and looks cute with any outfit. I don't like to tease my hair if I don't have to. It's not great for the hair and if you want to do a next-day style, without shampooing, forget about it! 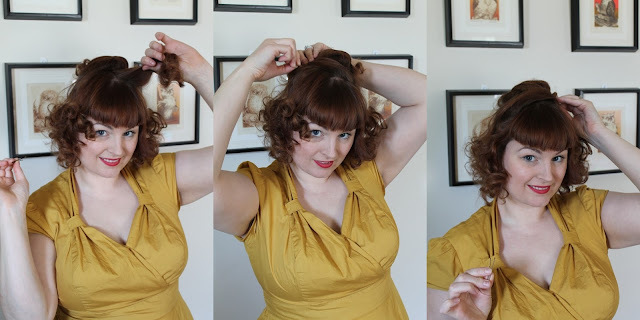 I'm also not crazy about beehives that have so much backcombing that they look like a bird's nest. The no-tease method can be as tall or toned-down as you like, just use bigger rats for taller beehives. I like a moderate height for daily styles. I'm pretty tall and anything taller hits the roof of the car! All you need for this look is a hair rat, a ton of bobby pins and a coat of hair spray. 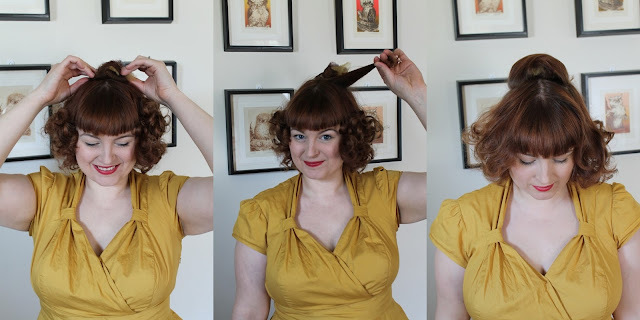 I started with curled hair but if you're in a rush, just pin it up, tuck the ends in and you're ready to go! If you don't have bangs, sweep them up as part of your beehive or side part them and pin up. 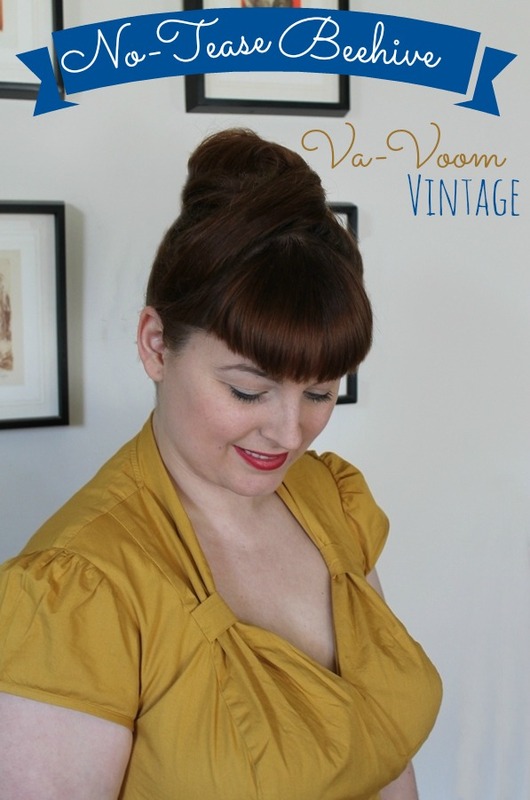 For a more woven look, use smaller sections of hair, wrapped in opposite directions. Perfect!I hate teasing my hair so this is good to know. Hi Brittany! I've been reading your blog for a few months, but never commented till now. I love this idea! I did a beehive recently and it was a teasing mess! I will have to try this one soon. You are my inspiration to be more vintage :) keep up the great work! Crazy cute and I would have had no idea that your haircut was short! I just chopped mine all off, but a couple inches more and I'll have to try this! This style looks sensational on you, dear gal! and that top you are wearing! where is it from, I must know. MUST! 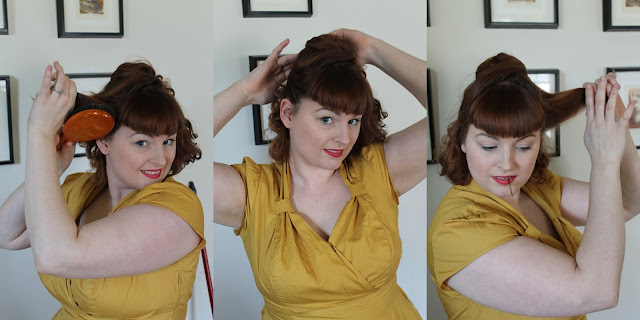 It's actually a dress from Eshakti! I love the top so much but the skirt part is a bit short so I'll probably cut it off into a blouse because I LOVE that neckline!! Hey Brittany - I just tried to follow the link and it looks the page no longer exists! Is it possible for you to post the full tutorial here? Thanks!